Name Variation Anna Seamandel was also known as Annie. Married Name before 1913 As of before 1913,her married name was Schulte. Anna Seamandel was born circa 1893 at Wisconsin. She married John R. Schulte before 1913. Married Name 15 August 1941 As of 15 August 1941,her married name was Schulte. Kathryn Pyffereon married Harold C. Schulte, son of John R. Schulte and Anna Seamandel, on 15 August 1941. Kathryn Pyffereon died on 11 October 1965. Married Name 18 June 1946 As of 18 June 1946,her married name was Klitzke. Married Name 18 June 1946 As of 18 June 1946,her married name was Kitzke. Mabel Emily Lena Schulte was born circa 1925 at Wisconsin. She was the daughter of John R. Schulte and Anna Seamandel. Mabel Emily Lena Schulte married Paul F. Klitzke on 18 June 1946. Name Variation Paul F. Klitzke was also known as Kitzke. Paul F. Klitzke was born on 18 April 1916 at Reedsburg, Sauk, Wisconsin. He married Mabel Emily Lena Schulte, daughter of John R. Schulte and Anna Seamandel, on 18 June 1946. Paul F. Klitzke died on 7 September 1994 at age 78 Paul F. Klitzke, age 78 of Reedsburg, died on Wednesday, September 7, 1994 at the Reedsburg Area Medical Center following a long battle with cancer. He was born on April 18, 1916 in Reedsburg Township, the son of Albert and Dorothea (Licht) Klitzke. Paul was baptized as an infant at his home on April 30, 1916 by Reverend Paul Schaller and was confirmed in his faith as a youth on April 13, 1930 by Reverend Carl Schinnerer in St. Peter's Lutheran Church of Reedsburg where he retained his membership. On June 18, 1946, Paul was united in marriage to Mabel Emily Lena Schulte. Paul farmed in the Reedsburg area for many years before retiring in 1982 due to his health. Paul was preceded in death by his parents and brother, Ervin Klitzke. 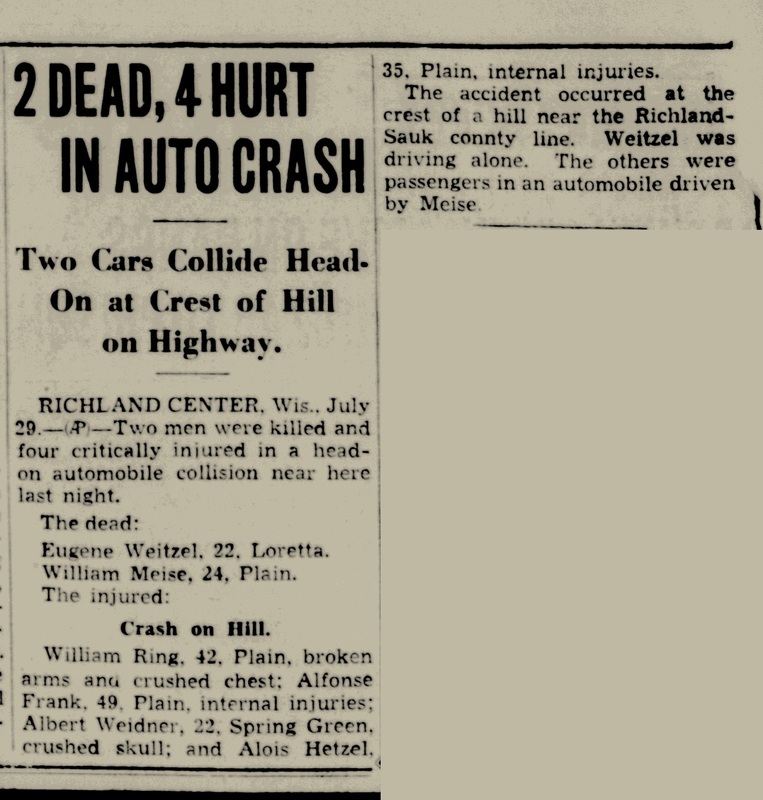 Paul is survived by his wife, Mabel of Reedsburg; brother-in-law; Harold Schulte of Hillpoint; sisters-in-law; Margaret Klitzke of Reedsburg, Lorna Schulte of Hillpoint and Helen Schulte of Hillpoint; 11 nieces and nephews, along with other relatives and friends. Funeral services for Paul F. Klitzke were conducted on Saturday, September 10, 1994 at 1:30 p.m. from St. Peter's Lutheran Church in Reedsburg with Reverend James Hendrikson officiating. Burial followed in St. Peter's Cemetery. Friends called on Friday from 4-9 p.m. at the Farber Funeral Home. The family requests memorials of remembrance be made to St. Peter's Handicap or Radio Broadcast Funds. The Farber Funeral Home assisted the family with the arrangements. Taken from the Reedsburg Independent. Alice Schulte was born circa 1915 at Wisconsin. Alice Schulte died before 1994. Name Variation Herbert L. Paulus was also known as Herb. Herbert L. Paulus was born on 4 May 1907 at Wisconsin. He was the son of George J. Paulus and Anna T. Alt. Herbert L. Paulus married Amelia E. Ruhland, daughter of John C. Ruhland and Elizabeth Hartl, on 10 May 1932. Herbert L. Paulus died on 25 February 1992 at age 84. David H. Watson Paulus was born in 1937. He was the son of Herbert L. Paulus. David H. Watson Paulus died in 1976. Mary K. Meise died in 1960. Marie Ederer was the daughter of John N. Ederer and Margaret C. Schutz. Marie Ederer died at died in infancy. Rita Ederer was the daughter of John N. Ederer and Margaret C. Schutz. Rita Ederer died at died in infancy. Name Variation Pearl Hemberger was also known as Hehenberger. Married Name Her married name was Grauvogl. Pearl Hemberger married Otto John Grauvogl, son of Joseph Grauvogl and Mary (?). Pearl Hemberger was born on 17 April 1892 at Wisconsin. She was the daughter of Ferdinand Hemberger and Anna Margaret Hutter. Pearl Hemberger died on 7 May 1978 at Wisconsin at age 86. [S243] U.S. Federal Census 1920 U.S. Federal Census, by Ancestry.com, Year: 1920; Census Place: Franklin, Sauk, Wisconsin; Roll: T625_2015; Page: 8B; Enumeration District: 164; Image: 85. Laverne Grauvogl was born in 1918 at Wisconsin. Laverne Grauvogl died in 1944 at killed in action. Irene Grauvogl was born in 1923. She was the daughter of Otto John Grauvogl and Pearl Hemberger. Irene Grauvogl died in 1928. Ralph Grauvogl died in 1936. He was born in 1936. Stephen Meise was born in September 1853 at Germany. He married Bertha Schroeter circa 1884. Stephen Meise died in 1947. Stephen Meise immigrated in 1884. He was naturalized on 14 September 1906 at Circuit Court, Baraboo, Sauk, Wisconsin. [S245] U.S. Federal Census 1900 U.S. Federal Census, by Ancestry.com, Year: 1900; Census Place: Ithaca, Richland, Wisconsin; Roll: T623_1813; Page: 7B; Enumeration District: 115. Name Variation Bertha Schroeter was also known as Gertie. Name Variation Bertha Schroeter was also known as Berthia. Married Name circa 1884 As of circa 1884,her married name was Meise. Bertha Schroeter was born in March 1854 at Germany. She married Stephen Meise circa 1884. Bertha Schroeter died in 1933. 1 June 1905 Franklin, Sauk, Wisconsin Bertha Schroeter appeared on the census of 1 June 1905 in the household of Stephen Meise at Franklin, Sauk, Wisconsin. Bertha Schroeter had 8 with 8 living in 1900 children. She had 8 with 8 living in 1910 children. Frank Meise Sr. married Amelia Volk, daughter of Joseph Volk Sr. and Theresa Kirshbaum. Frank Meise Sr. was born in February 1885 at Wisconsin. He was the son of Stephen Meise and Bertha Schroeter. Frank Meise Sr. died in 1974. 1 June 1905 Franklin, Sauk, Wisconsin Frank Meise Sr. appeared on the census of 1 June 1905 in the household of Stephen Meise at Franklin, Sauk, Wisconsin. Name Variation Wilbert J. Meise was also known as William. Wilbert J. Meise was born in 1912. He was the son of Frank Meise Sr. and Amelia Volk. 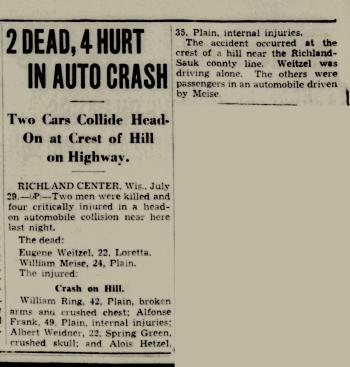 Wilbert J. Meise died in July 1937 at Wisconsin Car crash kills 2 (Eugene Weitzel and William Meise) and 4 hurt. Donald Meise was born in 1927. Donald Meise died in 1928. Amelia Meise was born in July 1888 at Wisconsin. She was the daughter of Stephen Meise and Bertha Schroeter. Married Name Her married name was Volk. Name Variation Mina Meise was also known as Minnie. Mina Meise married Leo Ralph Volk, son of Phillip Volk Sr. and Mary Zoerg. Mina Meise was born on 8 November 1889 at Wisconsin. Mina Meise died on 10 October 1978 at age 88. 1 June 1905 Franklin, Sauk, Wisconsin Mina Meise appeared on the census of 1 June 1905 in the household of Stephen Meise at Franklin, Sauk, Wisconsin. Name Variation Mathias J. Meise was also known as Math J. Name Variation Mathias J. Meise was also known as Mathew. Mathias J. Meise was born on 8 September 1891 at Wisconsin also reported as Sep 1890. Mathias J. Meise married Agnes Philomina Hutter, daughter of Pearson Hartman Hutter and Anna M. Stutz, on 29 November 1916. Mathias J. Meise died on 15 September 1984 at Sauk, Wisconsin, at age 93. He was buried after 15 September 1984 at Saint Aloysious Cemetery, Sauk City, Sauk, Wisconsin. 1 June 1905 Franklin, Sauk, Wisconsin Mathias J. Meise appeared on the census of 1 June 1905 in the household of Stephen Meise at Franklin, Sauk, Wisconsin. Mathias J. Meise obtained US Social Security Card at Wisconsin; last residence Sauk City, Sauk, Wisconsin. On 5 June 1917 at World War I Draft Registration, Sauk, Wisconsin. Name Variation Bertha Meise was also known as Bertie G.
Name Variation Bertha Meise was also known as Bertie J.
Bertha Meise was born in July 1894 at Wisconsin. 1 June 1905 Franklin, Sauk, Wisconsin Bertha Meise appeared on the census of 1 June 1905 in the household of Stephen Meise at Franklin, Sauk, Wisconsin. Name Variation John Fredrick Meise was also known as John L.
John Fredrick Meise married Magdalen Mary Walch, daughter of Engelbert Walch and Mary Reuter. John Fredrick Meise was born on 20 September 1896 at Wisconsin. John Fredrick Meise died on 16 February 1990 at age 93. 1 June 1905 Franklin, Sauk, Wisconsin John Fredrick Meise appeared on the census of 1 June 1905 in the household of Stephen Meise at Franklin, Sauk, Wisconsin. Lena B. Meise was born in July 1899 at Wisconsin. 1 June 1905 Franklin, Sauk, Wisconsin Lena B. Meise appeared on the census of 1 June 1905 in the household of Stephen Meise at Franklin, Sauk, Wisconsin. Marilyn Hying was the daughter of Elmer Hying and Coletta Clara Lucy Lins. Marilyn Hying died in 1944. Cathy Hying was the daughter of Elmer Hying and Coletta Clara Lucy Lins. Cathy Hying died in 1958. Name Variation Reginald Lins was also known as Reggie. Reginald Lins was the son of Henry Lins and Anna Augusta Hetzel. Reginald Lins died before October 2009. Harry Lins was the son of Henry Lins and Anna Augusta Hetzel. Harry Lins died before October 2009. Name Variation Agnes Philomina Hutter was also known as Agnes W.
Married Name 29 November 1916 As of 29 November 1916,her married name was Meise. Agnes Philomina Hutter was born on 26 May 1895 at Wisconsin. She was the daughter of Pearson Hartman Hutter and Anna M. Stutz. Agnes Philomina Hutter married Mathias J. Meise, son of Stephen Meise and Bertha Schroeter, on 29 November 1916. Agnes Philomina Hutter died on 28 November 1982 at Canada at age 87. She was buried after 28 November 1982 at Saint Aloysious Cemetery, Sauk City, Sauk, Wisconsin. 1 June 1905 Sauk City, Sauk, Wisconsin Agnes Philomina Hutter appeared on the census of 1 June 1905 in the household of Pearson Hartman Hutter at Sauk City, Sauk, Wisconsin. Agnes Philomina Hutter obtained US Social Security Card at Wisconsin; last residence Sauk City, Sauk, Wisconsin.